There’s more to life insurance than just death benefit. Think living benefits. “Did you knows” exist in many industries. It seems like the insurance industry is full of them. And I understand why. It’s a confusing market. Add to that the fact that many advisors push certain carriers and products. Of course stories develop and through conversations with friends and family you learn about ideas that may not be entirely true. This is where the “did you knows” come in. And for this quick article we will look at a did you know from Lincoln Financial. 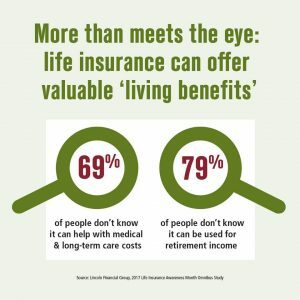 This infographic addresses the topic of living benefits which includes accessing the policy benefit for medical costs, long term care costs, retirement income, and other reasons. This is just one of the many “did you knows” and pieces of intel you can use from Lincoln to better understand the confusing landscape that is the insurance industry. We hope you find it valuable. For more statistics and insight from Lincoln Financial you can visit this link that contains many graphics.